The Stitch Matters: Sean's Merrow Story - Merrow Sewing Machine Co.
"After I graduated college, I worked in a sweater factory and we were using Merrows from the 60's. I was a pattern maker but became a mechanic there. Loved working on them because they were designed with the mechanic and sewing operator in mind. Jumped ship to a thermal cut and sew plant, once again a pattern maker and a customer asked for a "rail road" hem. Top management was puzzled at the machine... my old friend the 2-thread Merrow. Fast forward a few years, I'm now a consultant/salesman in the sock and hosiery industry and flat seaming is all the rage. 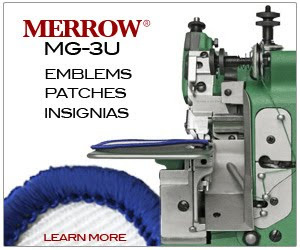 I've converted a few customers to Merrow and they have seen not only a better seam but it's so much faster and operator friendly. I've rebuilt so many of your [Merrow] machines, keep up the great work, the quality of craftsmanship has shown throughout the decades." Sean pulls parts from this "Merrow Graveyard"
Send us photos, videos, or a text blurb telling us about your Merrow story and we'll send you a free Merrow shirt!